Do you need a UK pie expert for your next story? Do get in touch with Rob, Sam, Tim and Anna at pierateship@yahoo.co.uk. As you can see here, we do love to talk about pies! Here's what people have been saying about us. We were featured by the BBC for their Price of Football 2014 survey. 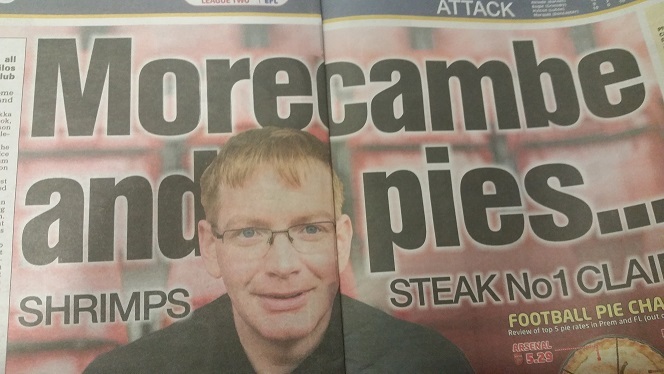 Pierateers RAS and SJL jetted off to Morecambe FC for this media appearance, where they gave some advice to the BBC cameras on what makes a good football pie. You can watch the clip on the BBC website. 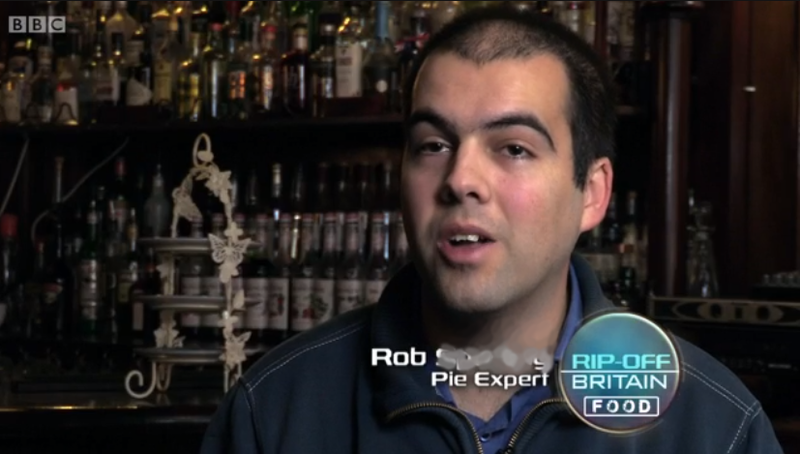 On top of this, we were invited onto BBC One's Rip Off Britain as "pie experts", where Pierateer Rob advised the Great British public on what makes a quality football pie. And let's not forget that time RAS and The Ship's Cook were invited onto the Great British Bake Off: An Extra Slice - and got Michel Roux Jr to eat some of their crocodile pie! We've also been on BBC radio a number of times, including BBC Radio 5 Live and speaking live to Mark Forrest on the Mark Forrest Show. Mark even commented on how Pierate was one of the best websites out there! Thanks Mark, we do our best! Coral the Bookmakers chose the Pierateers to glean some info on what's important in a top football pie, interviewing us as part of a football pie survey they were running on the best pies in the Premier League. You can view their initial article about the survey here and see the results in this post, which we then were asked to analyse on our blog in our article "We bet you'll want to know the top football pies!" Pierate has featured in the Daily Telegraph, when the Pierateers were quoted in regards to the pasty controversy at the British Pie Awards 2016, where a pasty was crowned Supreme Champion. They focused on our quote that it was "a sad day for pie fans" and that we, for the first time, wouldn't be rating the BPA winner. 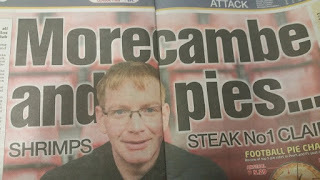 Pierate were interviewed as part of the Sun's article on the pies at Morecambe FC - with an aptly punned headline "Morecambe and Pies". They even used our PIEremiership table's top 5 results to create a pie chart showing who we had rated as the top 5 pies in football, with Morecambe FC coming out top! The other football pies to make it in the pie chart at the time were Man City, MK Dons, Bristol Rovers and Arsenal. Pierate has featured in the Daily Star on Sunday a couple of times, with pie expert Rob giving the lowdown on what makes a great pie and also an interview with Sam about why a diet of pies may not be as unhealthy as you think. Labelled as "Britain's number one pie blog", Pierate got a great shout-out - thanks Daily Star! "Whilst researching the best places to go for pie, we came across a fair few great pie resources we just had to share with you..... last but definitely not least – Pierateers. This is the web’s premiere pie resource. They’ve been rating pies since 2009. 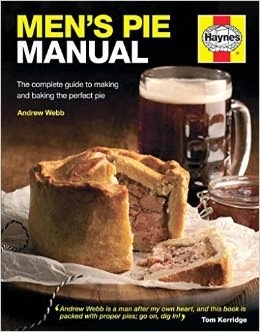 Trust the Pierateers"
Andrew recommends Pierate in the Troubleshooting section of his excellent Men's Pie Manual. "pierate.co.uk. Reviews for pretty much every kind of commercially available pie you can get in the UK. Each pie is scored using the Seven Cs: colour, capacity, consistency, capacity, chewiness, cheapness, content and condition." p185. Thanks for the shout-out, Andrew! 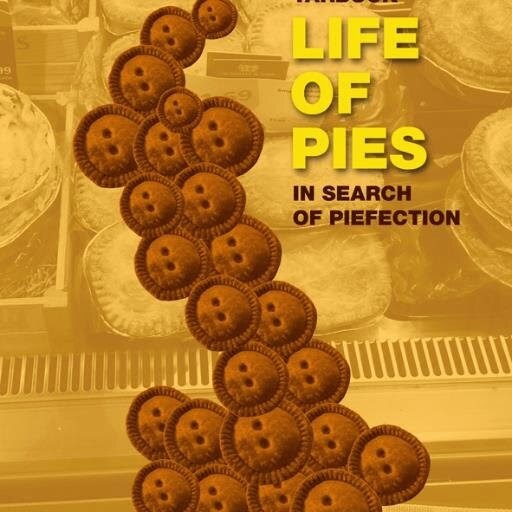 Martin Tarbuck loves eating pies so much he's written a book about it. He also described Pierate as: "Stir into the pot (or foil tray) their dedication, innovation and downright passion and what you’ve got is a website that if you could put it’s ingredients in the oven in a fully encased pastry would represent the perfect pie. The Pierateers have taken pie eating to a cult level." Cheers Martin, that means a lot coming from you.